You acknowledge and agree that the copyright and other intellectual property rights in this Website and in all information and materials on this Website ("Website Content") are owned by Bendigo Cinemas, its affiliates, suppliers or licensors unless expressly indicated. The Website Content is protected by Australian and international copyright and trademark laws. anything else which would infringe Bendigo Cinema’s rights or the rights of Bendigo Cinema’s content suppliers. You may view this Website using a web "browser" so long as you don't change the form of copyright and other proprietary notices. If you are interested in a piece of content for your personal, non commercial use, you may save a single copy, print one or download one. You may be asked to provide Personal Information to Bendigo Cinemas before purchasing any movie ticket, goods or services from this Website, before entering any competition on the Website or before registering as a member of this Website. If you do not provide that Personal Information to Bendigo Cinemas, Bendigo Cinemas may not be able to sell you movie tickets, goods or services, enter you into that competition or register you as a member. You acknowledge that if you do not register as a member of this Website, parts of this Website designed for registered members may not be accessible to you. You agree to keep all membership and registration information secret and accept responsibility for all actions performed by any person accessing this Website using your member account. Bendigo Cinemas may use techniques designed to identify fraudulent activities on the Website, such as fraudulent credit card use. If any unauthorised use of your credit card occurs as a result of your credit card purchase on the Website, you should notify your credit card provider in accordance with its reporting rules and procedures. You agree that Bendigo Cinemas may cancel your registration as a member and/or refuse you access to this Website at any time in its sole discretion. For any information or material provided by you for entry into any competition hosted on this Website, or any comment made by you in respect to any information on this Website, you agree to grant us irrevocable, perpetual, royalty-free, non-exclusive, worldwide license to use, reproduce, modify, sublicense, redistribute, adapt, transmit, publish, broadcast and display that information or material and create derivative works from it. A booking fee per ticket will apply to all tickets purchased via this Website. Where allocated seating applies to a session you have the choice of choosing your own seat on the Website. Otherwise seat allocation for movie tickets purchased via this Website is on a "best available" basis and is carried out by a prescribed computer program. You agree that Bendigo Cinemas may at its discretion, refuse to sell movie tickets to you or withdraw any movie tickets from sale via this Website. Prices on this Website include GST where applicable. Bendigo Cinemas provides hyperlinks to third party sites for convenience only, and the inclusion of the hyperlink does not imply any endorsement of the Linked Site by Bendigo Cinemas or its affiliates. In addition, the inclusion of third party advertising on this Website (whether with or without hyperlinks) is not an endorsement or recommendation of the third party advertiser by Bendigo Cinemas or its affiliates. the performance of any obligations owing to by any person who administers or owns any Linked Site. You acknowledge and agree that apart from where required by law, this Website and all Website Content are provided "as is" without warranties of any kind, express or implied. that movie tickets to any particular cinema, movie or session will be available for sale to you. You irrevocably submit to and accept the exclusive jurisdiction of any of the Courts of the State of Victoria or the Commonwealth of Australia and any courts of appeal from these courts. This policy applies to purchases of Gift Vouchers, Movie Dollar books and associated products from the Bendigo Cinemas website online store. b. Where a product is not as described or the incorrect product has been delivered. 2) Bendigo Cinemas may, at its sole discretion, offer a refund or exchange in selected cases that are beyond the requirements of legislation. However it is under no obligation to do so and this provision should not be relied upon when making a purchase decision. a. Any refunds or exchanges made under this provision will require a copy of your tax invoice (email receipt) as proof of purchase. In all cases, consideration for an exchange or refund will only be given if the Gift Vouchers, Movie Dollar books or associated products have not been redeemed. All items including any bonus items or gift packaging must be returned or a refund/exchange will not be available. Requesting a Return, Refund or Exchange. To request a return, refund or exchange, please use the contact form on our website, or phone 03 5440 8001. Phone contact is available between 9.00am to 5.00pm. We will then contact you within 2 working days to discuss your request. Goods will be dispatched within 3 business days of your order. In most cases vouchers will be dispatched by the following day of the order being recieved. For example, if you place an order on Monday, we will dispatch your order Tuesday. While every attempt is made to keep all products in stock at all times, on rare occasions a product may be temporarily out of stock. Should this occur, the customer will be contacted and alternatively arrangements discussed. This may include, at the customer preference, a refund, alternative product being supplied, or waiting until the product is in stock. All products are dispatched via Australia Post Express Post. A delivery cost of $7.00 per order applies, added to your order at checkout time. For delivery locations within the “Express Post domestic network”, including local deliveries to Bendigo and surrounding areas, the expected delivery date is the next business day following the date of dispatch. Prompt delivery, (unguaranteed) is given to locations outside of the “Express Post domestic network” network. 6) Details of your concerns. We will then track the delivery and attempt to ascertain its location, subject to information being available from Australia Post and as appropriate send out replacement product. One complimentary voucher will be provided to a customer who purchases Bendigo Cinemas or Village Cinemas Gift products to the value of $100 or more in one transaction. The purchase must be made in one transaction in cinema or from the Bendigo Cinemas Gift Shop before 11:59pm on 2 September 2018. Limit of one complimentary voucher per person per day. Vouchers can be redeemed at the ticket box for movie sessions screening between 9th August, 2018 and 10th October, 2018 at participating Village Cinemas locations*. Vouchers are not valid for Gold Class sessions, 4DX, Special Events, group bookings, Baby Friendly, Kidz Flix, Sensory Friendly, Seniors Session, Flicks with the Chicks, movie marathons or in conjunction with any other offer or promotion unless otherwise stated. Not valid for movie sessions starting from 5pm on Saturday. Not for films listed as NFT. 3D glasses (if required) are $1 extra each. For Bendigo Cinemas Gift Shop purchases, the complimentary pass will be mailed to the delivery address provided. For Village Cinemas Gift Shop purchases, the complimentary pass will be emailed to the purchasers email by the following Friday after the purchase. *To enter, comment or tag on original competition post before 5pm Friday August 31, 2018 . Prize includes 2 x 2 traditional cinema passes to be used within the printed expiry and within the printed T&C's. Winners will be notified on Facebook Friday August 31, 2018. *The 'Peter Mac Charity Ticket' is exclusive to Vrewards Members. $1 from selected standard ticket purchase will be donated to Peter Mac. Offer valid for sessions screening between Saturday 2 March and Sunday 3 March, 2019. To purchase these tickets, simply present your valid Membership ID in cinema or sign in to your Vrewards account online. Offer excludes 4DX, Gold Class, Special Events, Kidz Flicks, Baby Sessions, Vrewards Screenings, Seniors Sessions, Family Fun Days, Flicks with the Chicks and Date Night screenings. Offer is not valid for films distributed by The Walt Disney Picture Company, Entertainment One, Twentieth Century Fox or Paramount. Does not include Vrewards tickets purchased with points, free tickets or discount recognition tickets. This offer is not available during unexpected system outage periods that are beyond our control. 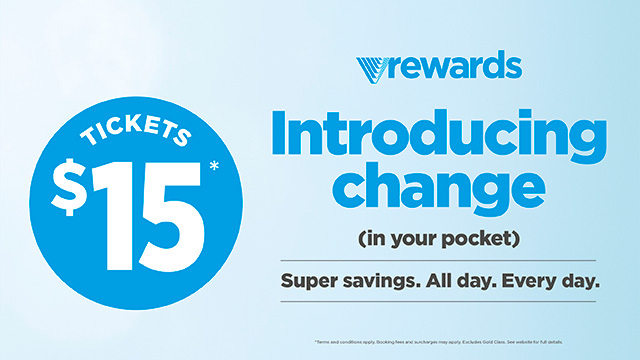 ^Vrewards Member Ticket prices (“Vrewards Member Ticket”) are exclusive to Vrewards Members. To purchase a $15 Vrewards Member Ticket, simply present your valid Membership ID in cinema or sign in to your Vrewards account online. Booking fees apply for online purchases. A Vrewards Member is entitled to purchase one $15 Vrewards Member Ticket per session only unless otherwise specified. Surcharges apply for 3D, Vjunior, Vmax, Vpremium and Dolby Atmos sessions. 3D glasses (if required) are available for purchase from the cinema location. Offer excludes Gold Class, 4DX, special events, movie marathons, group bookings, or for tickets priced below $15 and is not available in conjunction with any other offer or promotion unless otherwise stated. This offer is not available during unexpected system outage periods that are beyond our control.